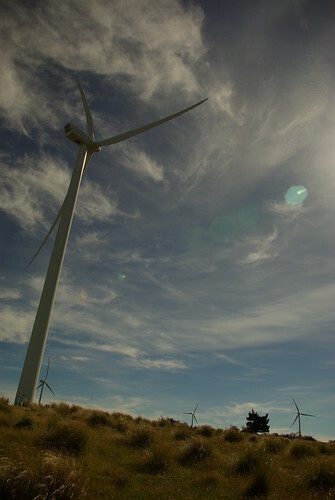 Mahinerangi Wind Farm, a photo by Samuel Mann on Flickr. We went to the Mahinerangi Wind Farm open day today. I’m still in two minds about the wind farms. On one hand an extremely efficient source of power, on the other an excuse for us not to face the real problem of profligate consumption. On one hand bespoiling a stunning landscape (and these are 12 of planned 100 in this site alone), on the other these giant structures are seriously elegant (more images on flickr).